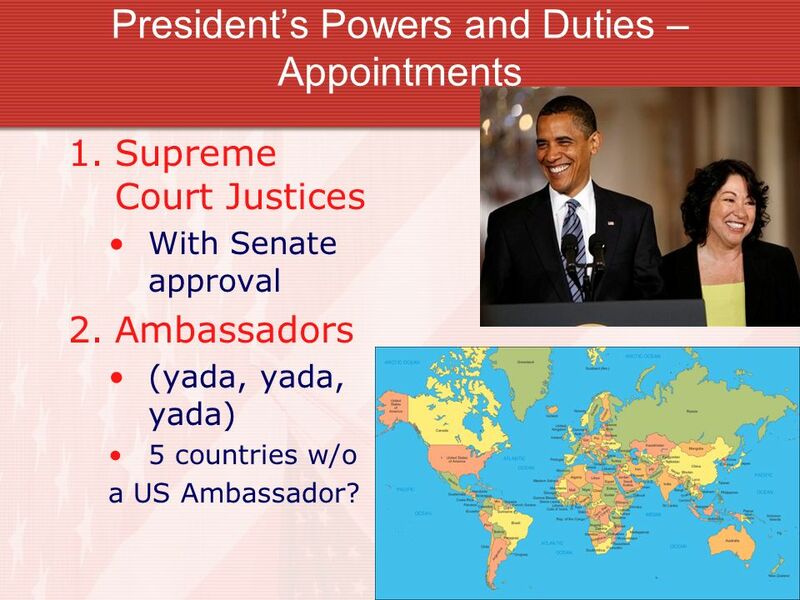 7 Presidents Powers and Duties – Appointments 1.Supreme Court Justices With Senate approval 2.Ambassadors (yada, yada, yada) 5 countries w/o a US Ambassador? 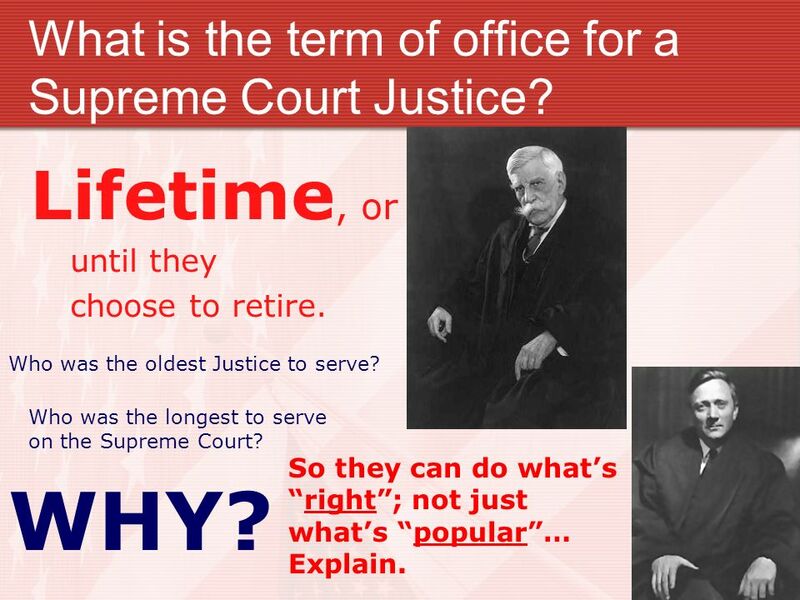 9 What is the term of office for a Supreme Court Justice? Lifetime, or until they choose to retire. WHY? Who was the oldest Justice to serve? Who was the longest to serve on the Supreme Court? So they can do whatsright; not just whats popular… Explain. 10 What check, or control, does the Supreme Court have on Congress? Right to decide on cases involving the Constitution, National Laws, Treaties, and Conflicts between States. 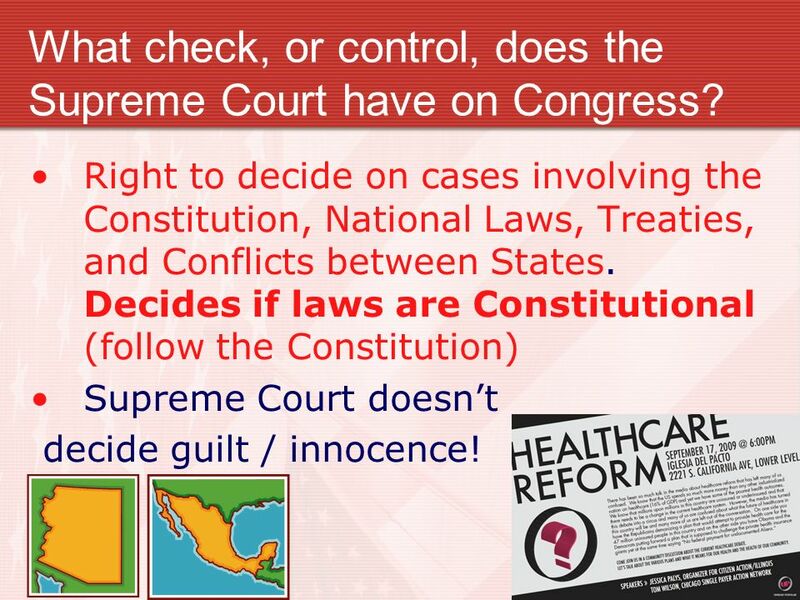 Decides if laws are Constitutional (follow the Constitution) Supreme Court doesnt decide guilt / innocence! 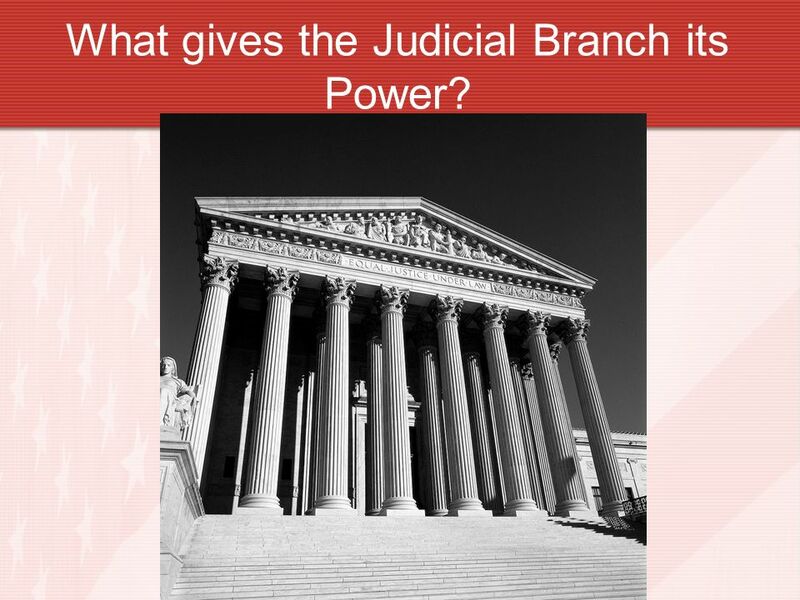 11 What is the Supreme Courts BIGGEST power? 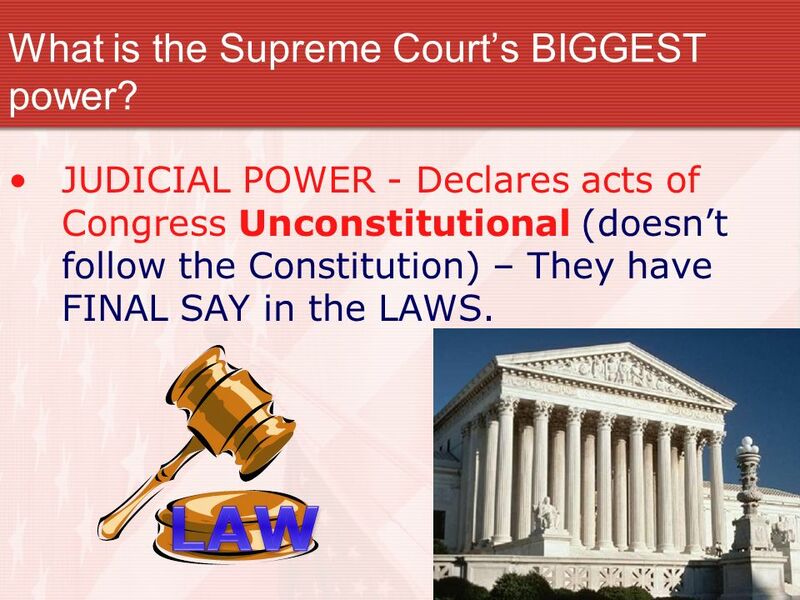 JUDICIAL POWER - Declares acts of Congress Unconstitutional (doesnt follow the Constitution) – They have FINAL SAY in the LAWS. 12 Treason How does the Constitution define treason? Waging war against, or aiding an enemy of, the US. 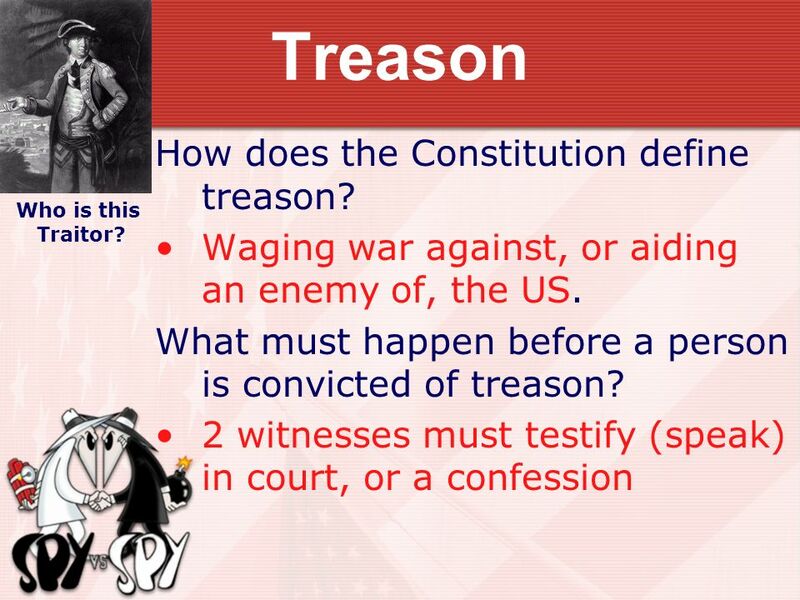 What must happen before a person is convicted of treason? 2 witnesses must testify (speak) in court, or a confession Who is this Traitor? 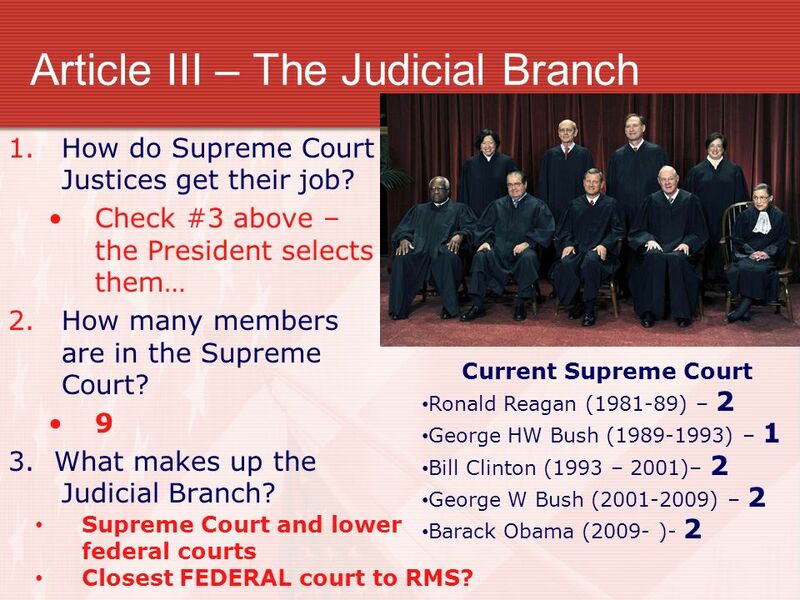 13 What gives the Judicial Branch its Power? 14 Essay Question????? 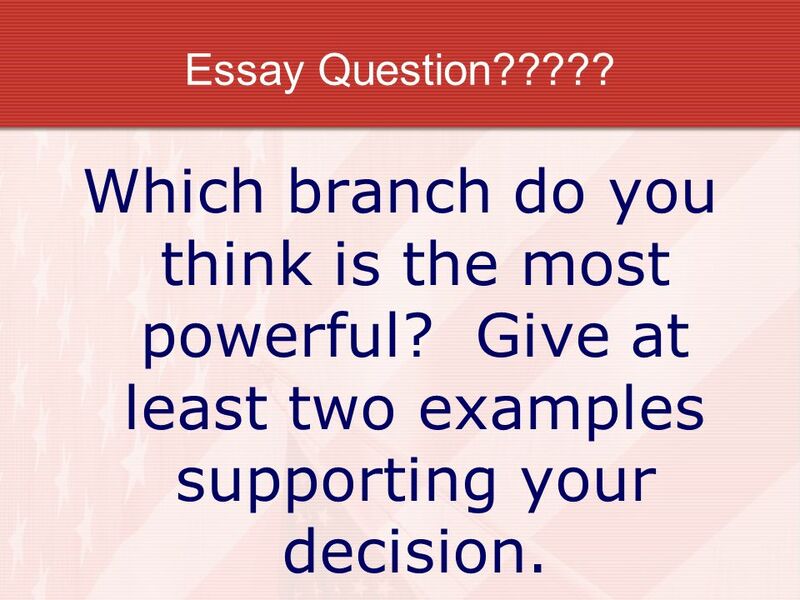 Which branch do you think is the most powerful? Give at least two examples supporting your decision. 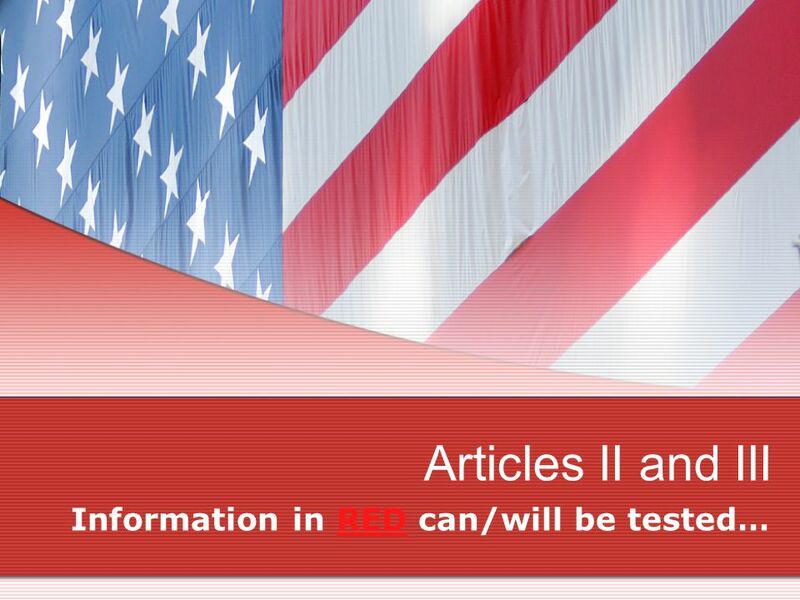 Download ppt "Articles II and III Information in RED can/will be tested…"
NUMBER YOUR PAPER FOR EACH STATEMENT WRITE YES OR NO IF YOU THINK THE PRESIDENT CAN DO THAT Can The President Do That??? 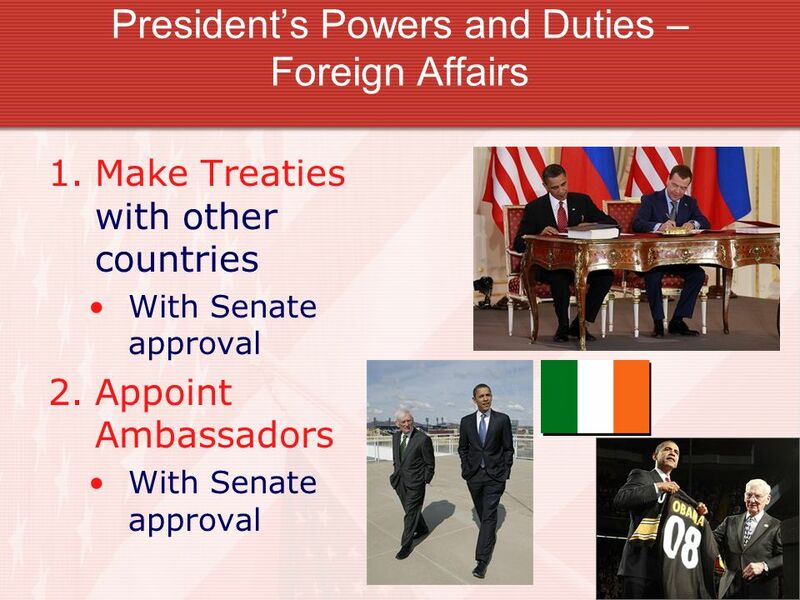 Separation of Powers When the powers of the U.S. government is divided among the three branches of government. The writers of the Constitution included. 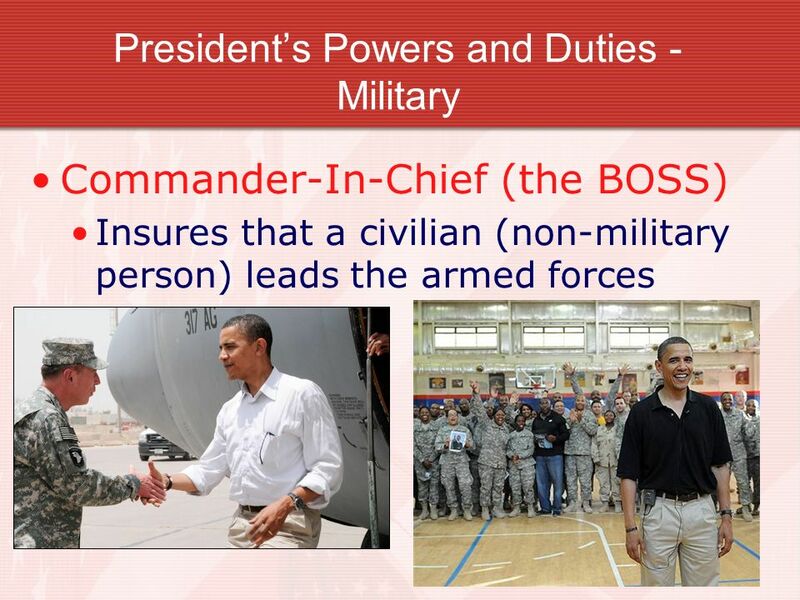 Learning Goal: S3C2-PO6: Analyze the structure, powers, and roles of the executive branch of the United States government: a. specific powers delegated. 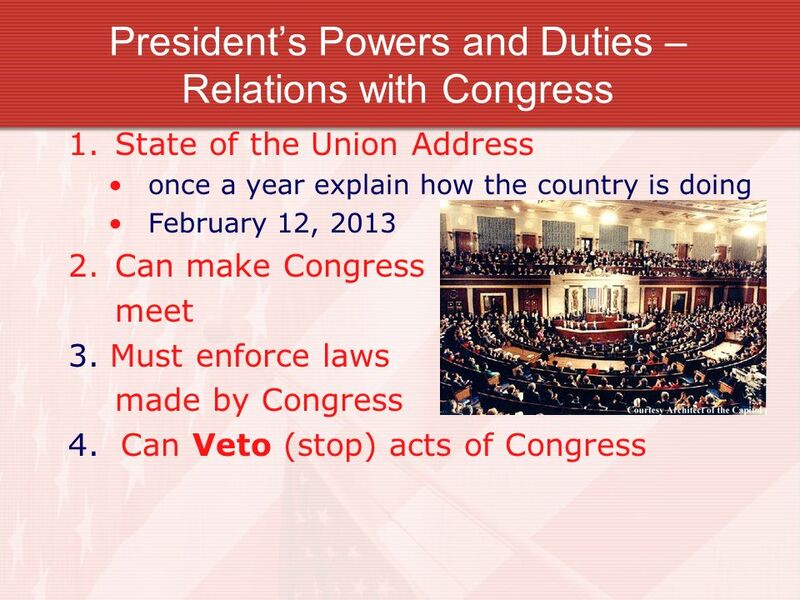 The Legislative Branch Article I of the Constitution establishes the powers of and limits on Congress. Know the qualifications and terms of each of the following Legislative, executive, judicial. 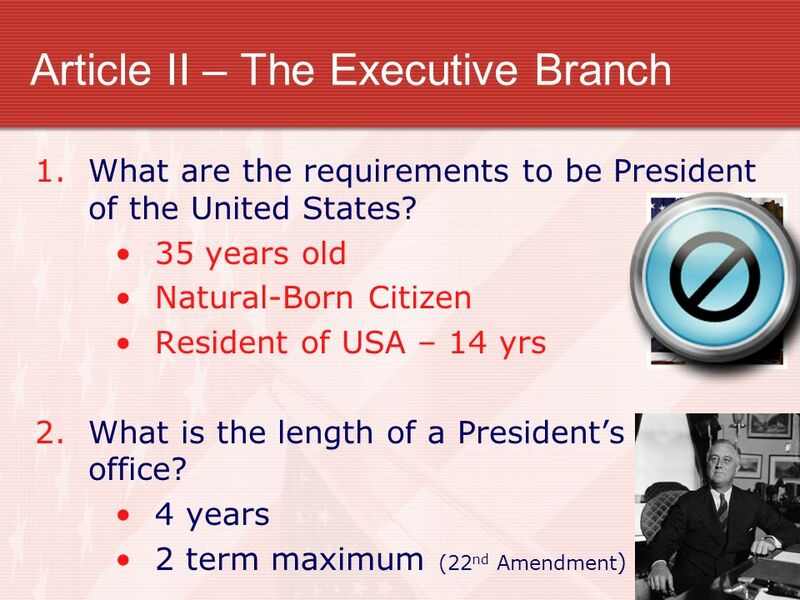 ARTICLE 2: THE Executive Branch President & Vice President are in this branch Job is to carry out the laws Executive officers are voted on by electoral. 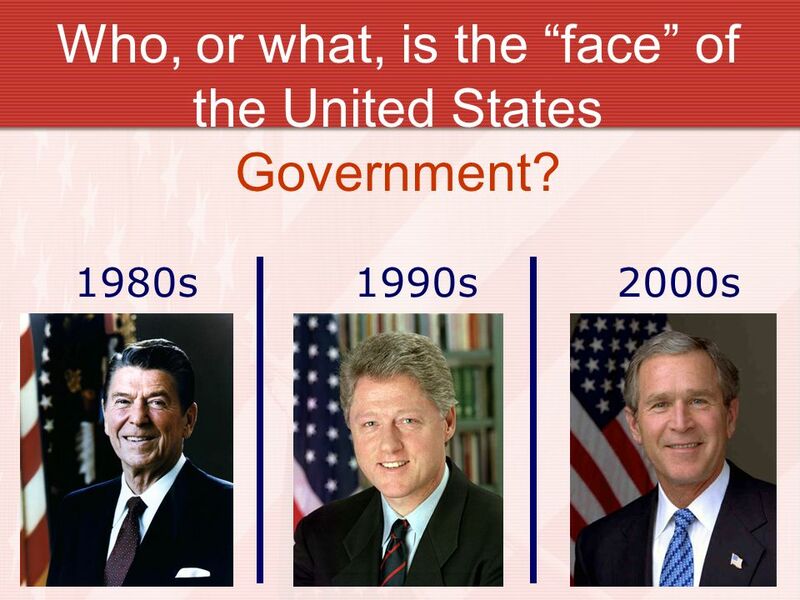 3 BRANCHES OF GOVERNMENT.  Take out your vocabulary for this section. DO NOW.